Film forms on the clot surface at the air-liquid interface. (A and B) SEM of film formed at the air-liquid interface in whole blood and plasma clots. 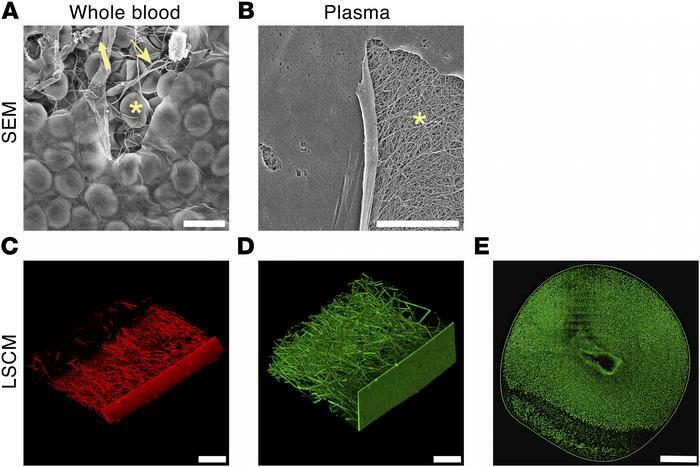 At places where the film is torn (due to SEM sample processing procedures), red blood cells (asterisk), platelets (thick arrow), and fibrin (thin arrow) are observed in whole blood clots (A), and fibrin (asterisk) in plasma clots (B). Red blood cells are also visible through the film in whole blood clots. (C and D) LSCM of film formed at the air-liquid interface in whole blood and plasma clots. Fibrinogen was fluorescently labeled with Alexa Fluor 488 (green) or Alexa Fluor 594 (red). Under fully hydrated conditions of LSCM, tears in the film were not observed. (E) LSCM of a single Z-plane slice of a plasma clot showing continuous film around the clot. The central gap in the clot image is where the pipette was introduced into the plasma drop to inject thrombin. Images represent findings reproduced in at least n = 3 experiments. Scale bars: A and B, 10 μm; C and D, 50 μm; E, 1 mm. All images are representative of n = 3 experiments.